Coconut cupcakes are usually my last choice on a cupcake menu. More often than not, they are cloyingly sweet and overly coconutty. But if that's what you like, you won't like my coconut cupcakes. No sweetened coconut, coconut cream or coconut extract--just a little unsweetened finely shredded macaroon coconut in a buttery vanilla batter. And a little of that same coconut, toasted and sprinkled over vanilla buttercream. Honestly, coconut is an assertive enough flavor; you don't have to beat me over the head with it! And don't let anyone tell you cake flour, or at least bleached all-purpose flour, is a must. I've been using Bob's Red Mill organic unbleached all-purpose flour in my cakes for ages with excellent results. These cupcakes could not be more soft, light, fluffy, tender ... all those things they're not supposed to be with unbleached all-purpose flour. If you like chocolate, these would be really good with chocolate frosting. How do you like your coconut cupcakes? Know what--if you like a big coconut flavor, why not try my recipe with a whole cup of coconut? Let me know how they turn out! 1 Preheat oven to 350 degrees. Put 2½-inch paper bake cups in two standard muffin tins (and several mini liners in mini tin). In small bowl, lightly whisk together the eggs, 1/4 cup of the milk, and the vanilla. 2 In large mixing bowl, combine all the dry ingredients and mix on low speed for one minute to "sift." Add the softened butter and 3/4 cup plus 2 tablespoons milk. Mix on low speed until combined. With mixer on medium-high speed, beat for a minute and a half. Scrape the bowl. 3 Gradually beat in the egg mixture in three batches, beating for 20 seconds after each addition. Scrape the bowl. Stir in coconut. 4 Using a 1/4-cup measure, fill the bake cups with a scant 1/4 cup of batter (use 1 tablespoon for each mini). Bake at 350 degrees for about 22 minutes or until they test done with a toothpick (8 to 10 minutes for minis). 5 Immediately remove from tins and cool on wire rack for an hour or so. They must be thoroughly cool before frosting. In bowl of stand mixer, or with a hand mixer, cream the butter until smooth. With the mixer on low speed, gradually beat in the powdered sugar. Scrape the bowl. Add the salt, vanilla extract and milk and beat on high speed until frosting is light and fluffy, about 5 minutes. You will likely have to add the liquid ingredients before adding all the powdered sugar. With a pastry bag fitted with a 2D tip, pipe closely spaced frosting flowers on cupcakes. 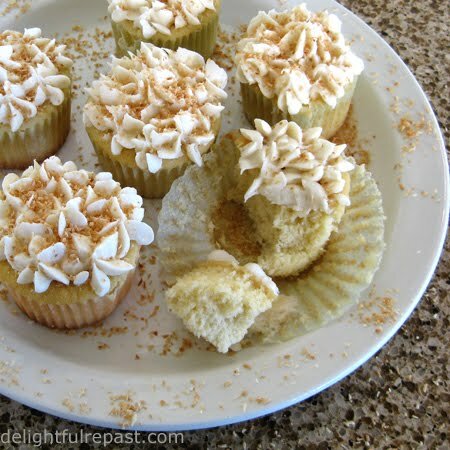 Sprinkle 1/2 teaspoon toasted coconut on each cupcake. I come late to the game for appreciating coconut, but these sound really good. (Even cloyingly sweet would work for me, if that's what these were, so no problem there!) Consider that yesterday I set Godiva Chocolates back three weeks on their factory orders. Hope your T-Day was as good as mine! Not a huge chocolate, or candy, fan myself. My childhood favorites were Mounds (coconut and dark chocolate) and Junior Mints. Suppose my adulthood favorites are two non-chocolates from See's--California Crunch and Key Lime Truffle. Your fairy cakes are so pretty & I am happy to read they are not too sweet. Thanks, Marla! And next time I'm going to frost them with a less sweet frosting. I'm a fan of coconut; and this looks so yummy! Will try this recipe soon! Thanks, Jun! I hope you like them as much as we do. I used 1/2 cup coconut for the ones with frosting and 3/4 cup coconut for ones I left plain to serve topped with whipped cream. My husband couldn't decide which he liked better. Well, I have to say that coconut is one of my all-time favorite flavors, so will be giving this one a try for sure! We recently tried using coconut flour for the first time, but so far haven't had much success as the texture just seems way too heavy. Have you used coconut flour in any of your culinary creations? And if so, what's worked for you? Coconut flour is made from the dried and defatted meat of the coconut, so it doesn't stick together very well. You would probably need to use xanthan gum and eggs in any baked goods. I don't think any of the gluten-free flours are satisfactory on their own but are best used in combination. I like to combine either brown rice flour or sorghum flour with both tapioca flour and potato starch. You might try the coconut flour with those two. I am *so with you on the coconut front*, I adore a subtle delicate taste of coconut & don't understand why people tend to drench the recipe in it... ughhh. Love the idea of these lovely little morsels, thanks for sharing. Thanks, Anna. Most of the people I've served them to say "These have just the right amount of coconut." I never realized there were so many people who felt the way I do. I love them with just 1/2 cup. This is a really clever idea, Jean. I know what you mean about feeling like the flavour can beat you around the head. Trying this out for sure. Thanks, Mr. P! Glad you stopped by! Let me know how it works for you. I do have a British Conversions page, you know. Yum! You had me at buttery vanilla batter. Subtle desserts are so much more satisfying than super sweet ones! Thanks, Meghan! Yep, so many coconut cakes are more like candy. Abby, thank you! I hope you will try the hazelnut shortbread. It's really good with tea. Everything I make is good with tea--must be a requirement with me! Come back in a few days for eggnog and more on shortbread. I'm not a huge fan of coconuts texture, but I do love the flavor. These look wonderful! Thanks, Jenn! If you make them with just the 1/2 cup of coconut, you hardly notice the coconut texture at all. These sound wonderful. How long would you say they stay fresh. I am looking for recipes for wedding cupcakes and we need to bake them the day prior. Hi! Making them the day before shouldn't be a problem at all. I've had them two days after baking, and they were fine. Have fun at the wedding! hahah yes! coconut is very assertive, that's the best way to describe it that i've ever heard. these cupcakes look adorable! Thanks, Bells. My husband, who always claimed to hate coconut, is practically addicted to these now! I like cupcakes as a child and I eat them until I was full, almost sick! Thank you! I hope you will make them soon, Raquel. But don't eat too many! Yes, just leave out the coconut and you have my basic "go to" vanilla cupcake. They turn out very light and fluffy. I hope you'll try them soon and let me know how turned out for you with the AP. Omg! Chocolate frosting would be delicious! Mmmmm! Thank you, ovendelights! Yes, chocolate frosting would be great, huh? Chocolate and coconut make one of those classic combinations.